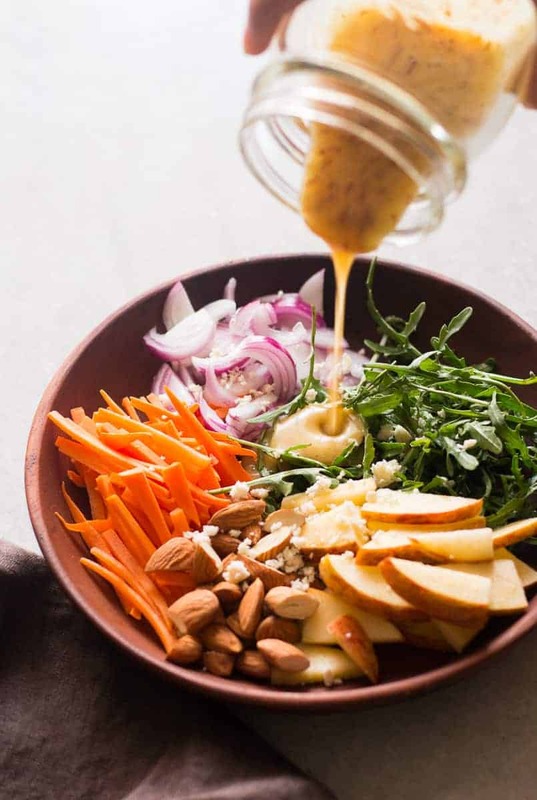 Apple Arugula Almond Salad with Orange Dressing – and with this we are well into the first week of January and still staying healthy! I can officially say that Denver and my sister love this salad. This is the MOST requested salad in the house and the flavours are just crazy. 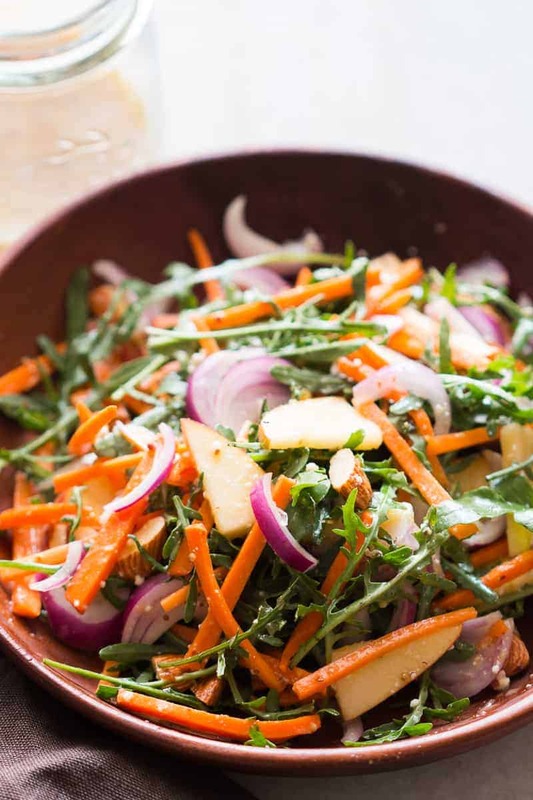 Sweet apples, lots of crunch from carrots, almonds, sharp arugula and spicy red onions and that sweet, salty orange dressing made from guess what – bitter orange marmalade – this salad is the shizzz. It gives us all kinds of good feelings in the house when we are contemplating fried chicken but choosing salad instead. No feeling of remorse or regret with this apple arugula almond salad. Instead, just healthy, clean, happy feelings of achieving our greens and salad quota of the day. And keeping it tasty. Because that’s my problem with ‘healthy’ food. Can’t we just make it taste good? I don’t want big chunks of iceberg lettuce dressed in a cloyingly creamy dressing made of mayonnaise when I say healthy salad. That’s not healthy. It’s just calories dressed as greens. I want my salad to taste good and not just be a chore. And this apple arugula almond salad is everything but a chore. Also our orange salad dressing is going to become your favourite as soon as you try it. I love using bitter orange marmalade because I always have some in the fridge. And if you don’t, just use orange juice and maple syrup or honey to substitute it. When we add some whole grain mustard to it, it takes our dressing to a whole new wow. And gives this salad life even more meaning. Friends if we are going down this healthy part together, we have to be honest with each other and our feelings towards food in general. While we’ve been mostly healthy, it’s time to make a few more changes, and let’s take some baby steps. Let’s remove junk one at a time and this apple arugula almond salad is my baby step. Are you with me? Thanks for being patient with my healthy eating plea and I’m hoping you are nodding your head to this salad. Because I can tell you, we are going to make you love salad life! If you try this out, I’d love to see your creations on Instagram. Tag your pictures #myfoodstory and I’d be sure to say hi! 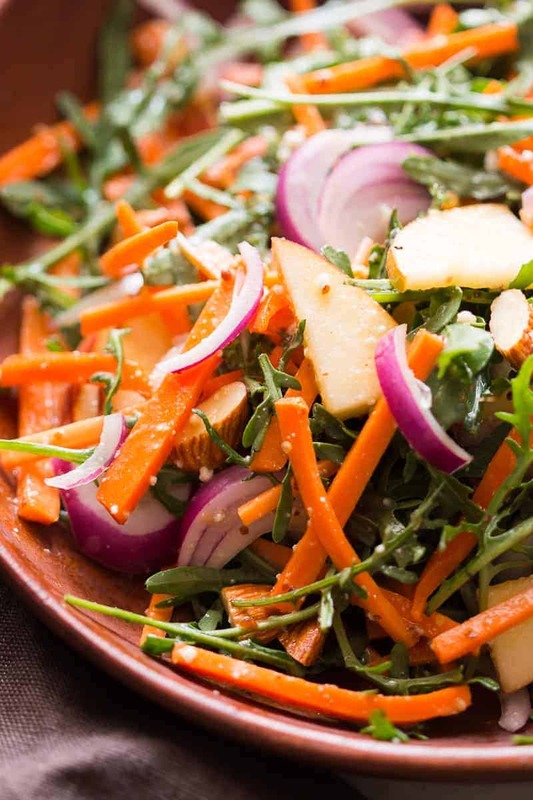 Apple Arugula Almond Salad with Orange Dressing is a quick, easy healthy salad that actually tastes good. Vegan, Gluten Free & the perfect side to dinner! Blend everything for the dressing in a blender till smooth and creamy. Put all the ingredients for the salad in a large bowl. Add the dressing and toss well. Serve immediately. If serving the salad later, refrigerate the dressing and other ingredients separately. Add the dressing just before serving or the salad will turn soggy. This looks amazing! Would you share though where you get arugula in Bangalore? I haven’t been able to find it. Hey Nandita, I’ve found Arugula at Natures Basket, Foodhall and at Namdharis. I absolutely love including a sweet element to my salads and this sounds heavenly! Loved this salad! Only change I would make for next time is cutting the amount of red onion in half, or possibly soaking it in water beforehand to get some of the bitterness out. It was a little overwhelming, but everything else was delicious! 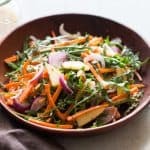 I can’t wait to try this salad, I love arugula and I know my husband would love it. Yaay! Maple Syrup would be amazing too! The dressing thickens up if you just whizz it in the blender for a minute or two.